The period from February to April is always a busy one for adjudicators (or music judges). Many music festivals, often those affiliated to BIFF, or the British and International Federation of Festivals, take place at this time, as well as other competitions organised by musicians far and wide. One such event is the Stars of the Albion, which is an international performing arts festival and competition. It’s an annual event, uniting young talented musicians and dancers from across the world. The project forms a unique bridge connecting different cultures and, in particular, that of Russia and Great Britain. It aims to provide valuable opportunities for young emerging artists to perform, learn, communicate and develop. 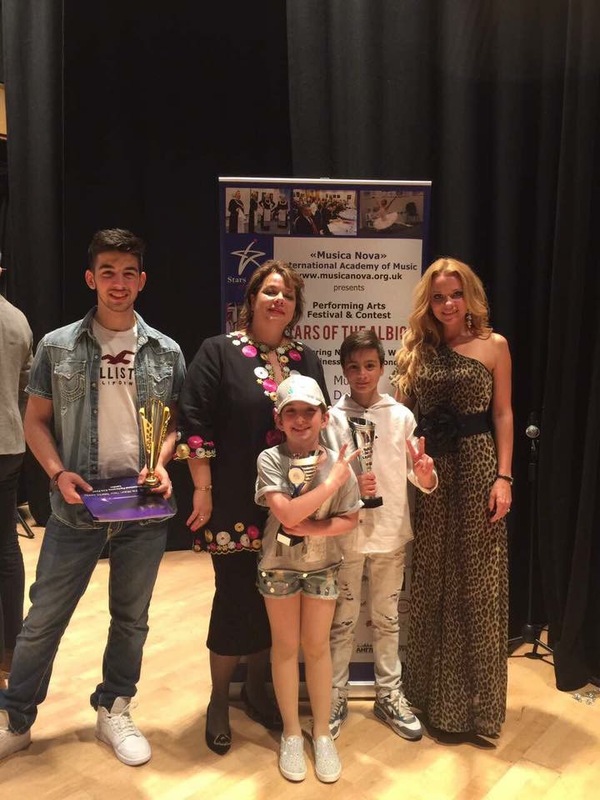 Organised and promoted by Musica Nova Academy of Music, which was founded and is owned by Russian singer, pianist and educator Evgenia Terentieva (pictured, second from the left, with some former winners). This bilingual establishment (situated just around the corner from King’s Cross station, on Crommer Street), combines the British and Russian principles of teaching. It’s held under the Patronage of the World Association of Performing Arts (WAPA) and is supported by the Rossotrudnichestvo, the Russian cultural centre in the UK. This is the 5th performing arts festival & competition, and it will be held from the 16 – 18 February 2018 in London (primarily at the Mission of Rossotrudnichestvo (Russia House in the UK) at 37 Kensington High Street, London W8 5ED). The competition consists of two rounds. The first one has been based on video recordings (either on DVD or YouTube), and the second round is open to the public and held at the concert hall of the Russian Cultural centre, and at the Musica Nova Academy. Forty soloists and fifteen ensembles or groups will be selected to come to London to participate in the second round. Participants come from Great Britain, France, USA, Malta, Cyprus, Russia, Bulgaria, Latvia, Ukraine, Armenia, Georgia and Ghana to take part in the competition. This is my third year on the panel of judges at this competition and it has always been a fascinating day spent with colleagues and fellow judges, hearing a complete mixture of music and dance. Last year I was one of four judges for the piano and strings section and the standard of playing was generally high. Anyone can attend this event. The awards ceremony and gala concert will take place on Sunday 18th February at 6.30pm at the Rudolf Steiner Theatre, 35 Park Road, London NW1 6XT. You can also attend the opening ceremony on Friday 16th February, which features performances of previous winners and some of the adjudication panel (at the Mission of Rossotrudnichestvo in Kensington High Street). (as well as classes in music theatre, fringe theatre, one man show, performance in fine art, and performance in photography). Age category: Children from 6 years old to adults, no age limit.